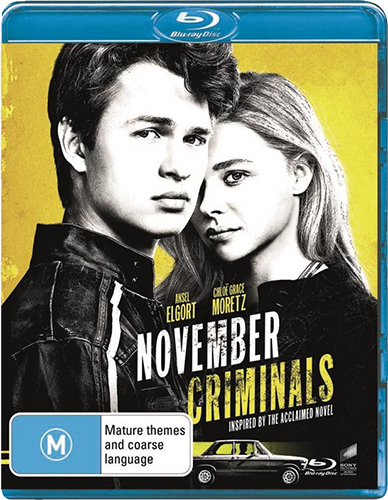 Win November Criminals: Ansel Elgort and Chloë Grace Moretz's dark thriller | SWITCH. In 'November Criminals', a pair of college-bound friends (Chloë Grace Moretz and Ansel Elgort) find themselves falling for one another, but after the mysterious murder of their classmate, they defy the authorities to uncover the truth. The film is directed by Sacha Gervasi ('Hitchcock') and also stars Academy Award nominees Catherine Keener (Best Supporting Actress, 'Capote', 2005) and David Strathairn (Best Actor, 'Good Night, and Good Luck', 2005). The 'November Criminals' competition has now closed. Winners will be announced shortly. Competition opens at 5pm AEDT on Sunday 28th January 2018 and closes at 11:59pm AEDT on Sunday 4th February 2018. Five winners will be chosen at random on Monday 5th February 2018. To successfully win, entrants must fulfil the above entry conditions before the time the competition closes. Current members/followers are eligible to enter the competition. Only one entry per person. Only one winner per household. To be a valid winner, the entrant must not have won a prize from SWITCH within the last 28 days. Each winner will receive one Blu-ray copy of 'November Criminals'. By entering, you agree to receive occasional emails from SWITCH in the future. If you decide to unsubscribe from these updates, any further entries will not be applicable. Only Australian residents are eligible to enter. 'November Criminals' is available on Blu-ray, Digital and DVD on Wednesday the 31st January 2018 from Universal Sony.